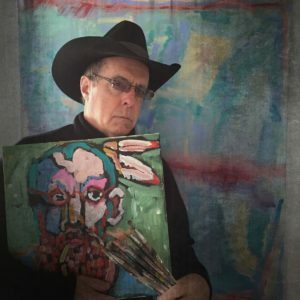 Tom Russell’s art has been acquired by the El Paso Museum of Art and is featured in a dozen galleries around the world, including The Rainbow Man in Santa Fe, The Liss Gallery in Toronto, Yard Dog in Austin, the Silvia Gallery in Switzerland, Cattle Tracks and Bill Bishop Gallery in Scottsdale, and others. Russell, a colorist in the tradition of Fritz Scholder, has been painting since 2003. He has published two books of his art, Blue Horse Red Desert and Folk Hotel: Reflections, Paintings, Lyrics. Since releasing his first album in the mid-1970s, Tom Russell has become a legend in the Americana music scene, with over 30 recordings. He has worked with many of the top musicians in his genre, such as Dave Alvin, Lucinda Williams, and the band Calexico. His songs have been covered by Johnny Cash, Nanci Griffith, Doug Sahm, Jerry Jeff Walker, Suzy Bogguss, and many others.